Caliphate was a religious and political institution which played an important role in Islamic history. During the Abbasid Caliphate, the Muslim civilisation reached its height. However, as there is always a rise and a fall of an empire, the same was the case of the Abbasid Caliphate - it also declined in the 9th century CE. Taking advantage of its weakness, provincial governors became independent and adopted the title of 'Sultan'. As a result of it, there emerged in the eastern part of the Caliphate, which was Central Asia, a political institution known as 'Sultanate'. These two institutions divided the Muslim world in different political units. However, their independent rulers recognised the Caliph as their spiritual and political sovereign. To show their allegiance to him, his name was recited in the khutbah and his name was also inscribed on coins. It was a tradition for every Sultan, after his accession to the throne, to get a certificate of recognition from the Caliph. When Muhammad Bin Tughlaq faced rebellions against him from all sides, he requested the Caliph to issue him the certificate of recognition to possibly stabilise his position in the eyes of his Muslim subjects. 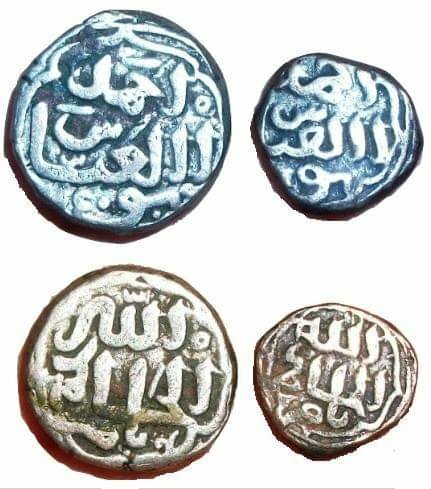 There are various coins minted in the reign of Muhammad Bin Tughlaq, on five of these coins name of Sultan is not mentioned and is replaced by the name of the ‘Abbasid Caliph Al-Mustakfi Billah Abu al-Raba Sulayman’, while the other three have the name of Caliph ‘Al-Hakim be Ammr Allah Abu al-Abbas Ahmed II’. These coins are made of copper or billon except two golden dinars, one of them on behalf of Caliph Al-Mustakfi, and the other on behalf of his son Al-Hakim II. Denomination - Billion tanka & 32 rati. In the name Abbasid Caliphate of Hakim II (1341–1352). Obverse: allah / al hakim / bi-amr. Reverse: ahmad / a al-abbas / bu. Great write-up on the background of these coins. Thanks ! IIRC, there were reasons to doubt the pedigree of Muhammad bin Tughluq. His father, Ghiyas-ud-din Tughluq was the son of a slave, his mother a Hindu concubine. I have no doubt that in those days, this would have been an argument against him. In addition, Muhammad bin Tughluq was largely unsuccessful, which would have made him politically vulnerable. Add the "forced token" issue, which would have chaos and loss of trust in the economy and you come to understand why there was so much resistance to his reign. Recognition from the Caliph and ruthlessness kept him on the throne, while his inheritance was falling apart in slow motion.